Some of La Gomera’s small south-coast beaches are inaccessible by land and thus only reachable by boat. Save hassle on vacation by prebooking your own private motorboat and securing it for a time that fits your schedule. 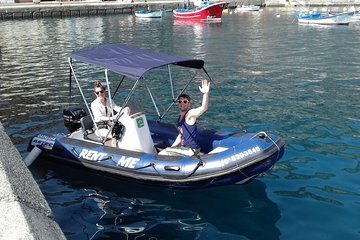 Then, travel independently to Playa de Santiago, settle into your easy-to-operate 5-seater craft, get instructions, and sail the surrounding coast to visit beaches, and swim and snorkel at leisure. No license required.